Quorum Sensing: What Is It? To begin with, I’d like to mention that it has been a while since I last wrote a blog post, around 10 months ago. And now, I believe that it’s time to begin writing about science once more. I’d like to try to write about what I’m into, or my current work or study once a week. This week, it’s Quorum Sensing! A lot of people ask what exactly quorum sensing is, well the definition written in a paper by Melissa Miller and Bonnie Bassler (2001) describes quorum sensing being the process and regulation of gene expression in response to fluctuations in cell-population density. Bacterial Quorum Sensing. Left shows individual bacterial cell releasing autoinducers when no threshold has been reached. Right shows a community of cells with large amount of autoinducers thus causing quorum sensing based gene expression and eventually the activation of this community of cells. The paper by Miller and Bassler (2001) describes in detail the way in which chemical signals, called autoinducers, can induce the process of quorum sensing. For example, bacterial cells are able to release these autoinducers signals which build up in concentration. Once the minimum threshold limit for these autoinducers have been reached, gene expression can occur in the affected population of bacteria causing a response from them. This could be anything from a potential toxin to a simple chemical reaction between the population of bacterial cells. It’s known that gram-positive and gram-negative bacteria use quorum sensing as a way of communicating with one another, usually to cause physiological activities. 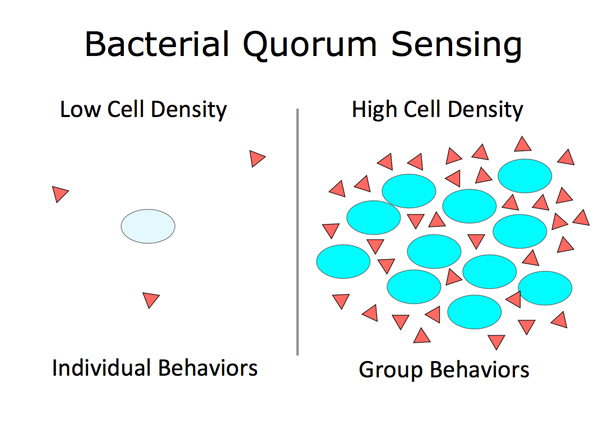 The discovery and understanding of quorum sensing opens up multiple ways in which cells, in general, could possibly communicate within a small to large population. It’s been known that quorum sensing largely looks into the cell density of a particular population, if the autoinducer threshold has been met, for example, pathogenic bacteria could potentially express and release toxins into the host. From the paper presented by Miller and Bassler (2001) there has been a large number of different discoveries and potential explanation to why certain bacteria’s behaving in a particular way. One particular way in which quorum sensing could potentially be useful in a study would possibly be within the world of cancer. It’s know that cancers cells, which usually mutate due to a number of potential factors, could possibly have certain links to quorum sensing. By monitoring and evaluating how certain types of cancers function, we could potentially see how they communicate. Using the logic within quorum sensing, and how that occurs within a number of different types of cells, it could allow for a number of different types of detection tools and ways in which quorum sensing can be used in order to potentially prevent cancer. To end this blog post, I’d like to post an awesome TED-Ed video by Bonnie Bassler herself as she explains quorum sensing. Author SunitePosted on December 3, 2015 February 16, 2016 Categories Biology, StudyTags Bacteria, Cells, Quorum SensingLeave a comment on Quorum Sensing: What Is It?